I was so pleased to participate in the 12th Annual Santa Fe Recycled Art Festival. What a talented group of artisans working towards a collective goal of being kind to the planet. Such great stuff - creativity I haven't seen in another show- I fell in love with so many items! Definitely had booth envy and got lots of great ideas for next years show as I WILL definitely be back! 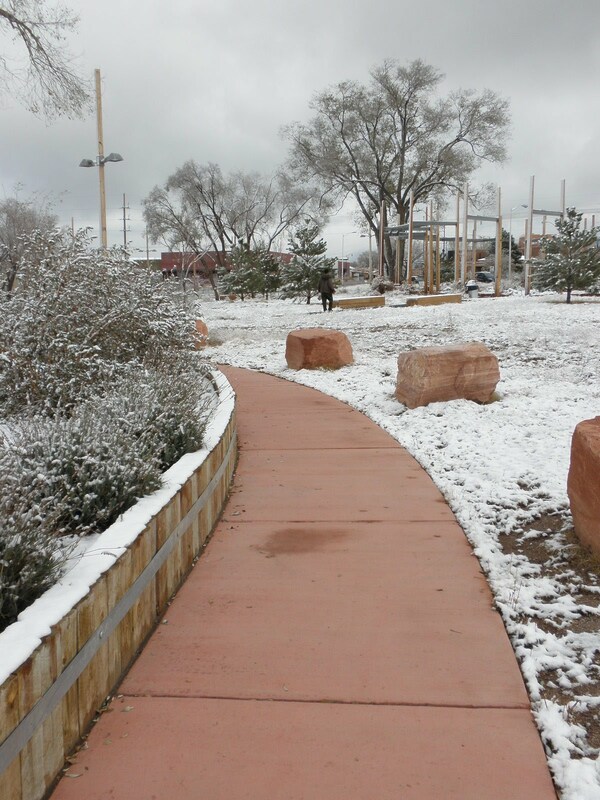 Loved Santa Fe, of course - such a great vibe there. Met some awesome people who loved my work and sold lots of stuff - got a commission - Yippeeee. Lots of opportunities to follow up on - I am so grateful. The booth and my art continue to get better and better. What a fun way to celebrate my birthday this year. 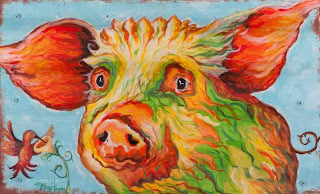 Oh, and my cow (Moo Love) made the postcard for the promo piece - one of three featured. Yippee again! The last two shows were super fun too! Billings was in a great park - met some great people and enjoyed some great art purchases. I was kinda sad that this was my last show in Montana but I know I'll be back next summer and add some more cities on the tour. I'd like to do a show in Bozeman and Missoula and then farther north and west. I've heard I didn't even get to see the most beautiful part of Montana - next time! 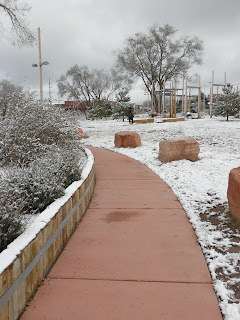 My hubby met me in Billings and we traveled south together thru Wyoming and then Colorado. I think that was the most beautiful part of the drive - we didn't go on any interstates! Two lane roads thru little towns are the best. We felt like we got to see an IMAX movie every day we were on the road. We loved Boulder for sure. What's not to love with so much natural beauty wrapped up with a gorgeous downtown (loved Pearl St.) and lots of outdoor activities. We got to go tubing right in town - wow! We stayed with friends and had bbq's and music and lots of laughs. The show was at the 29th street mall outside which was different for me. It was all good though, lots of interest in pet portraits in Boulder which was fantastic! Can't wait to go back. Back at home in the studio painting and entering shows for the fall. Austin, Texas is the next city at the end of September! Can't wait. I am writing a positive saying everyday on a eraser board. This is a photo of one of them. I want to spread joy to the world thru my words and paintings and this has been a fun addition to my space at the booth. I am having so much fun at the Expo!! I am meeting my first pooch to do a pet portrait tomorrow and I am very excited. Lots of activity and interest. An artist from the show as she was leaving said to me last night "I have fallen in love with 2 of your paintings and if I have any extra $$ at the end of the show I am buying them." How sweet - even the artists want to buy my labor of love. I am working on a press release that focuses on recycled art so cross your fingers I'll be getting some additional press for the show. I am feeling more comfortable in my shoes so to speak in front of people painting all day and learning how to market myself better (knowing what to say, how much to say, when to say, etc). Each day I get a little more knowledgeable. I am convinced that the positive energy radiating from my booth will translate into a very profitable show. I've been coined "The Tinwoman"
If you know me for any length of time you would learn that my favorite movie is The Wizard of Oz. This movie inspires me because for that time period it was a really creative movie (ahead of it's time), the characters are rich and I love the moral of the story. I've always believed that there is no place like home (home in your heart anyway). So, it's been funny to have artists call me that name because I am painting on reclaimed tin. The tinman wanted a heart so he could feel love. It's funny how sometimes we believe we must have something from the outside world in order to feel love inside. I have been pondering what kind of love I've been searching for and what comes to mind is unconditional love for myself and thus others as well. Seeing the best in people, expecting good to happen, trusting where I am at is perfect and who I am is perfect I think is what it means to me. Whenever I don't feel love remembering it's not something a wizard out there is going to give but a choice I make during each moment of every day. Love myself unconditionally. I have started writing down an inspirational sentence at my art booth and I am gonna take pix everyday of what I write and send post them. Artists are getting exciting about seeing them now. It's fun. You'll have a couple tomorrow. You never know where your inspiration is going to come from right? This paintings colors were inspired by the pajamas of my great neice Penny! I happened to be wearing pink that day too so it was pretty funny. Pink stands for unconditional love I've been told so I am all for having it in my life! The show is continuing to open doors for me and show are many good things yet to come. I have a strong interest on two pieces, the bear and the wolf from two separate woman. I know both pieces will end up in a good home very soon!!! The woman who liked the bear said this - It's nice to see NEW creativity at this show. Something fun, and colorful and not the same-ole, same-ole southwestern art. It's refreshing! Another comment: Your work has a liveliness to it and expresses your personality. This is the super fun painting I have started at the show of a Saguaro Cactus. It's got lots of great colors! This is me at the show. I have now had 3 days of comments from over 300 people and I am listening. The words that keep coming up are fun, colorful, happy, funky, and whimsical. That's me alright. I have started receiving peoples business cards and have someone interested in a dog portrait of their Jack Russell Terrier!! Yippeee! I am getting more comfortable and enjoying all the input I am receiving. 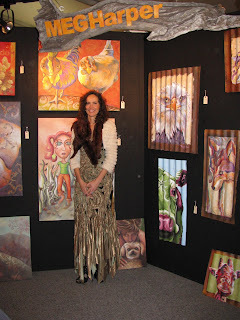 One of the other artists at the show called me a non traditional southwestern contemporary artist which was cool. I think it's fitting. Happy Hours are at 5pm everyday on the patio! First day at the Fine Art show with my recycled art - Visit me and buy some art! Thought I'd update you on the first day of the Arizona Fine Art Expo. The artists and their work looked fantastic. I felt honored to be apart of the show with the quality of work displayed. This is day 1 of 72 so you'll be hearing from me quite often as I have time during the day to jot comments and such down. 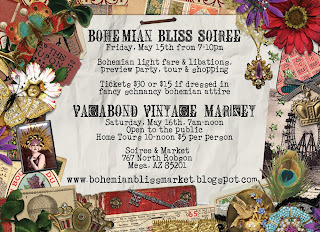 This event is taking place at MacDonald Ranch which is over 12,000 acres of land off Jomax and Scottsdale Rd., who knew there was such a huge ranch in North Scottsdale, not me! I even had Dan, the cowboy who works at the ranch, buy me my first bowl of soup for lunch! He is quite the character. I also won an award already at the show for losing my name tag first. Hilarious. There were quite a few sales, none for me YET! It felt good to see so many people smile when they passed by my paintings, the recycled metal ones were very well received. Anyhoo, here are some comments about my work that people shared with me during the day. I love the bright colors of your work. I love the eyes on the Mexican Wolf. I love your stuff, it's so funky. Your colors flow like a river thru the painting. Someone said my work reminded them of a childrens book illustrator named Audrey Woods. I haven't looked her up yet. Happy I am that yesterday went so well and I got to share my work with over 100 people. The artists are all super nice and I am looking forward to the next 71 days! I have written a note to read every morning at my booth that says: My paintings sell easily. I sell more paintings every day. I bring joy and sunshine to everyone I meet. I post pix tomorrow of the event and my booth! Wanted to wish everyone a happy, healthy and prosperous New Year!! I've been painting away over the holidays doing some dog portraits, family portraits and faux work. I feel very blessed to have the gift of painting to share with the world. 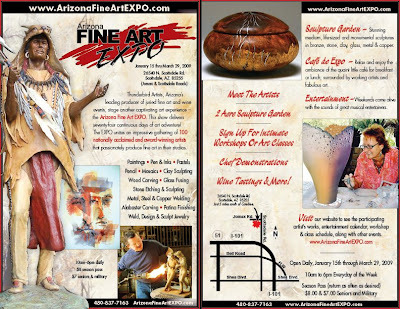 I will be live and in person at the Arizona Fine Arts Expo off Jomax and Scottsdale Rd. 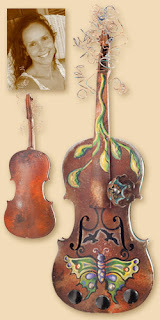 in the BIG white tent selling my newest recycled artwork on corrigated metal and painting away if you want to visit me. It's a 10 week show from January 15th thru March 29th. There are 100 artists there so it's quite the event with entertainment, parties and more!